This is Pedraforca massif and the winding road to the summit. If you want to know more find out in previous posts (I think this is the fourth post about the same topic). Being serious now, I would like to express my most sincere and deep thoughts to the families of victims at train bombings in India. This world is going nuts and I can't help it, that generates nothing but frustration in me. I just hope our children are more clever than we are. Wow .. this is amazing. I don't think I can walk to the top. It looks so high. look at that view, simply breathtaking! Another amazing shot! And it's great to included people in it if only to show the immense size and beauty of nature. I'm with you on the state of the world. All we can do is hope our children take with them our teachings. The scary thought is that the world is filled with people who live in some form of paranoia and that can only lead to anger and war. One step at a time. Eventually we reach the summit. Peace and serenity awaits. Simply stunning. Would love to return to Catalunya to get into some of these areas. last brief visit took me only to Barcelona and Girona. Thanks Poramit and Edwin for appreciating the detail of using people as reference. Thanks Edwin for relating the journey to the summit with the issue we were dealing with. I kind of admire your sincere and wise comments. Thanks Sally, I hope you can return and travel around the whole region. We have many beautiful spots to admire (of course in the rest of Spain there is also a great variety of landscapes).Thanks ~tanty~, I couldn't get to the top either as I mentioned in previous top, but I had a great time. Thanks Kris for raising the Israel bombing on Beirut issue. To say the truth I was a little late with my condolescences to victims in India, killings and crimes against humanity pile up and I don't have time to assimilate so much cruelty. I only know that every time I read newspapers I get sick and very sad. Lots of wonderful, natural layers in this photo. Looks like a beautiful spot. This looks like it came out of a children's story book. Excellent photo. 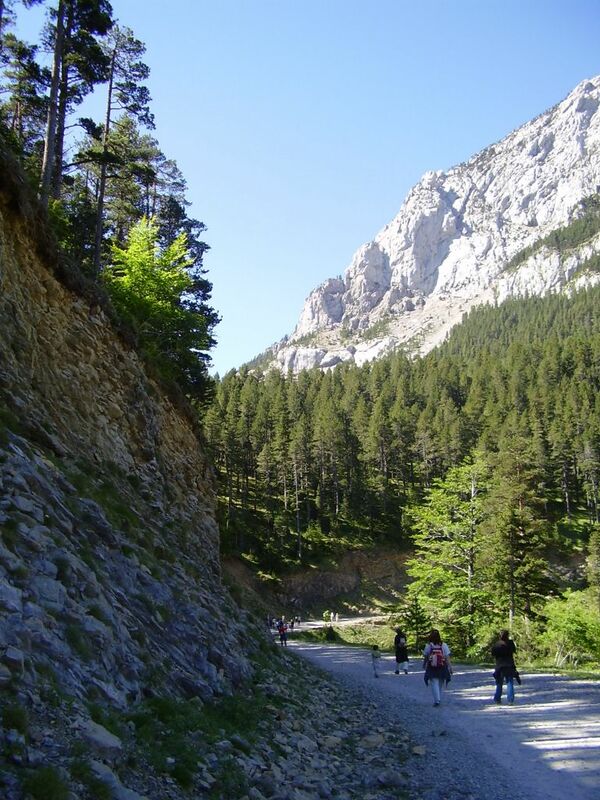 I would want to walk on this stony way but probably to much sun for me...We are used to go to the Alpes and when our children were smaller, they climbed like little goats! I do agree with you about all this violence and i doubt about human nature. Such a paradox - the power and majesty of nature and the environment and the blind stupidity of Little Man everywhere just burning our beatiful planet up. That's what this brilliant photo reminds me of. Curiously, I once lived for 7 months right on that Israel-Lebanon frontier and not only is it like its own Garden of Eden, but so much of it looks incredibly like your photo! Then try to imagine katyusha rockets hitting school buses on one side, followed by sonic-booming warplanes raining more hatred down on the other side...So sad. This is a PS to my earlier comment. i was just looking at your pic. again & suddenly I remembered a black/white shot I took up on that Is-Leb frontier walking one late-autumn afternoon with a few friends. You know what? It's uncanny, the resemblance!The shade from the side, the pine trees on the slopes, even the angle, with the 5 friends walking along! I need to get it digitalised, then I'll post it, so you can see. How weird! It looks like a beautiful place for a hike. Another lovely large , grand shot. Thanks nowhere man, I would like to see your picture.